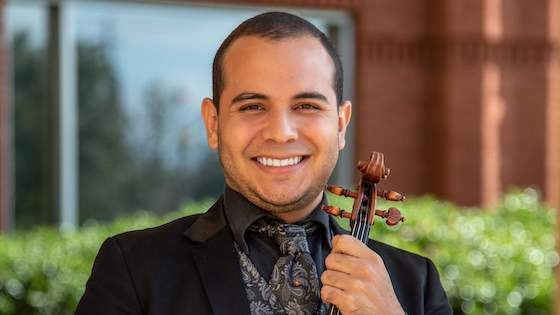 March 27, 2019, 12:52 PM · Congratulations to violinist Samuel Vargas, 22, who was among 11 young musicians selected as winners in the 2019 Yamaha Young Performing Artists competition. The other winners are listed here. "For more than 30 years, the YYPA program has supported music education and helped foster the careers of young, aspiring musicians," said John Wittmann, director of artist relations and education, Yamaha Artist Services. "We are thrilled to honor Samuel for his remarkable talent at this phase of his music career and watch as he builds upon the YYPA legacy in his path to a promising future." The annual program, conducted by the Band and Orchestral division of Yamaha Corporation of America, recognizes young artists ages 18 to 22 years in jazz, classical and contemporary genres. Brown and the other 2019 YYPA winners each receive an all-expense-paid trip to the YYPA Celebration Weekend, which will take place in June as part of the Yamaha's Music for All Summer Symposium at Ball State University, with workshops, clinics, performing opportunities and career advice. This year's winners are from Curtis Institute of Music; Manhattan School of Music; DePaul University; Northwestern University; California State University, Long Beach; Rutgers University; The Colburn School; Eastman School of Music; Columbus State University; University of Michigan and California Institute of the Arts. Vargas, of Acarigua-Araure, Venezuela, participated from the age of 11 in the El Sistema Program, a publicly-financed music education program founded in Venezuela in 1975. He has received numerous awards, including Concertmaster Ambassador of The United Nations 2014, Pin Artistic merit's city key of Prince George and Pin Central Bank in Canada. He has performed with the Simon Bolivar Orchestra, Vancouver Symphony Orchestra, Prince George Symphony Orchestra, Venezuela National Philharmonic and Georgia Philharmonic, collaborating with artists such as Gustavo Dudamel, Simon Rattle, Daniel Barenboim, Luis Miguel Gonzalez and Christian Vasquez. He has performed in 40 countries on international tours. Since 2017, Vargas has been a student of Sergiu Schwartz at the Schwob School of Music at Columbus State University. Since his arrival, Vargas has won numerous competitions including the Virtuoso Category for the Samuel Fordis Competition, Music Teachers National Association in the Young Artist Category, the Woodruff International Scholarship and the Jefferson Symphony Orchestra Concerto Competition. Vargas also has been a professor at El Sistema Program and Saint James Music Academy and has founded a number of Venezuelan chamber orchestras. March 27, 2019 at 08:18 PM · He goes the music school at my university! I’ve seen him play many times as well as the other Schwob performers. It’s a real privilege! March 30, 2019 at 01:39 PM · We are thrilled to have Samuel perform with the Jefferson Symphony Orchestra this weekend! April 3, 2019 at 06:46 AM · I have been following his shows from long time. I love his shows. Now he is also acting in some of the movies I think. You can watch all movies and TV shows for free on CotoMovies app. Get it from website.